Active full or part-time UW-Stout students, faculty and staff qualify for use and installation of Office 365 products on up to five devices at no cost. Installable titles include: Word, Excel, PowerPoint, OneNote, Access, Publisher, Outlook, Skype for Business, and OneDrive for Business. Log into the browser version of Outlook. You can do this by going to logins.uwstout.edu and clicking email. You will have two options. 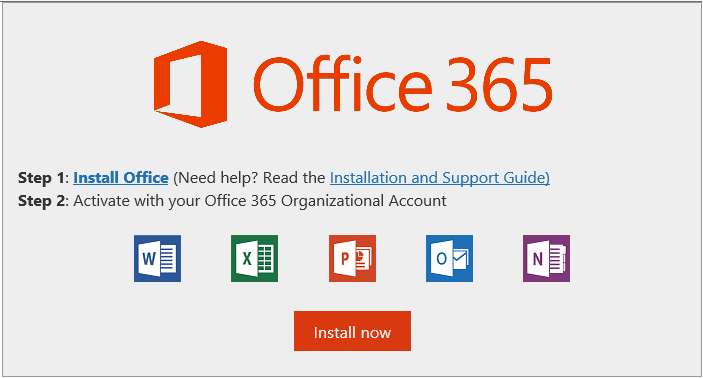 Most users can just click "Office 365 apps" to start the download. If you do choose "Other install options", you will have the option to change the language and version of Office to install. Having trouble installing? Microsoft maintains a troubleshooting site. NOTE: Account and product key issues addressed by this site are NOT applicable for UW-Stout's Office 365 accounts; no key is required. Already have Office 365 Home? Microsoft recommends uninstalling the home version prior to installing Office 365 for Business. Eligibility is limited to active students, faculty, and staff. Alumni and retirees are not eligible for installation of Office 365. Support for the installation of Office 365 by the Technology Help Desk is limited to consultation. Computers must meet Microsoft's Office 365 system requirements and have internet access. Problems with installation may arise due to malware or hardware issues. The Technology Help Desk can only provide general guidance for resolving these issues and cannot service personally-owned computers. Office 365 -- What is Office 365 Education for Students? Office 365 -- What are the eligibility requirements for Office 365 Education for Students? Office 365 -- How long can I use Office 365 for Education? Office 365 -- Can I share the Office 365 plan with others?